First shown in the US in 2015, The Lion Guard: Return of the Roar TV movie enchants and thrills young children in every country it is screened. Based on the original Lion King film, The Lion Guard introduces Kion as the next lion leader of the Pride Lands. Never slow to snap up a hot toy licence in the UK, Flair have created a fantastic selection of toys with the Pride Lands Playset taking top spot as the hero product. This awesome jungle set has lots of working features including trap doors, a working vine lift and a rather menacing looking bone trap! Naturally the playset includes a selection of animal figures with Kion standing guard over all of his kingdom. Other Lion Guard toys include plush cuddly animal characters such as Fuli the cheetah, Beshte the hippopotamus and Rafiki the wise old baboon. There’s also a selection of collectable figurines and a choice of extra playsets. 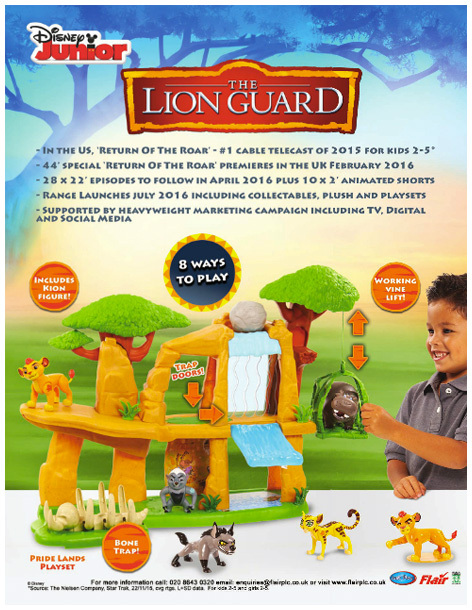 Please tell us what you think of the Pride Lands Playset by Flair.